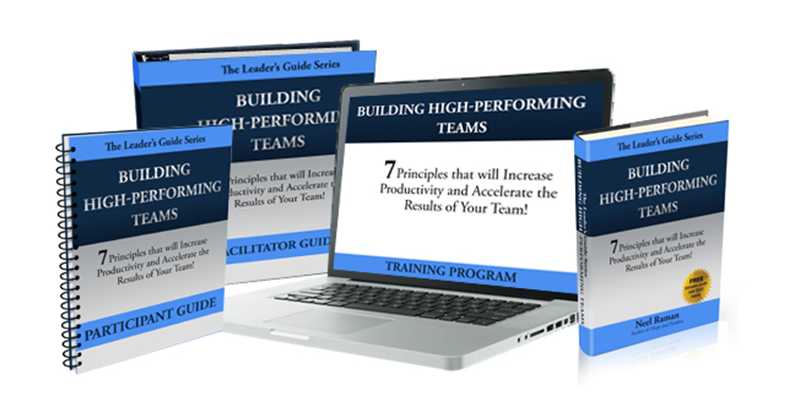 Now You Can Easily Transform Your Team into a High-Performing and Effective Team! This facilitator kit will guide you through the process of making your team more engaged, cohesive and productive, while improving the bottom-line results of your business. While it is best to deliver this program as a two-day training, it can also be delivered as weekly sessions over 10-11 weeks, multiple half-day sessions, or two 1-day sessions, the Building High-Performing Teams Facilitator Kit consists of 11 sessions, with each session designed to build upon the previous session. The Building High-Performing Teams Facilitator Kit provides everything you need to deliver a high-impact, half-day, full-day or two-day learning experience for your team. This kit has been designed to elevate a functional intact team that works together to solve problems and accomplish tasks. This digital kit can be downloaded immediately after you’ve completed your purchase. What will you get with this facilitator kit? A 110-page Facilitator Guide has all the scripts, exercises, and activities you will need to facilitate this program. A 96-page Participant Guide is for attendees of the program to capture their notes and complete all the exercises. PowerPoint slides can be used in a classroom-based setting and can be fully customized. A Session Planner that breaks down the time required for each session and will help you plan your sessions better. A Team Assessment which will reveal how well your team is performing according to the principles of Building High-Performing Teams. Order Today and Get this Special FREE Bonus! As a way to give you additional support, I will also offer three one-on-one coaching calls, where you can discuss with me how to make the content in this facilitator kit more relevant to your team. We can also discuss any challenges you may be facing in your team and how to overcome them. This bonus is valued at $750! (This bonus is valid up to three months after your purchase. All you have to do is contact me to schedule your sessions). The normal investment in the Building High-Performing Teams Facilitator Kit will be $997 for the complete program, including INSTANT ONLINE ACCESS to everything mentioned above plus the special bonus mentioned below. BUT… you can order the Building High-Performing Teams Facilitator Kit now at an introductory price of just $497, a savings of $500! (That $497 is a one-time payment. There is nothing else to buy and you get access to all the material immediately after your payment has been processed). Special Bonus: Get three free one-on-one calls with Neel Raman to discuss anything about how to use the material in this kit. This is valid for three months after your purchase and is valued at $750. The normal investment in the Building High-Performing Teams Facilitator Kit will be $997 for the complete program, including INSTANT ONLINE ACCESS to everything mentioned above plus the special bonus mentioned below. BUT… you can order the Building High-Performing Teams Facilitator Kit now at an introductory price of $197 per month for three months. Special Bonus: Get three free one-on-one calls with Neel Raman to discuss anything about how to use the material in this kit. This is valid for three months after your purchase and is valued at $750.